Just Can’t Get Enough of the Thai Tims? The Thai Tims are a group of enthusiastic and inspirational young Thai students that attend a very special school in Chantaburi, in the east of Thailand. This is the only Thai school that takes in children who have down-syndrome and allows them to have an inclusive and normal education, just like every other child. The Thai Tims are made up of children who attend the school and they learn English through fun games, activities, sports and mostly through learning Celtic themed songs taught by Pun and Paul Lennon, the founders of the Thai Tims and the Good Child Foundation. The idea being that the support the Thai Tims receive locally and internationally (and there is a lot of it!) 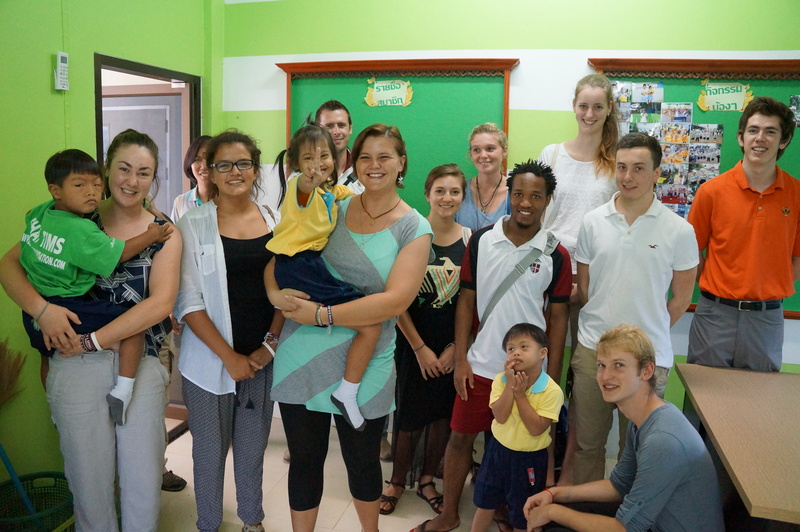 allows the school to provide the necessary resources to take in Thai children with down-syndrome. Watch this video if you Just can’t get enough of the Thai Tims! The Thai Tims have quickly established a cult following, especially on social media and among football fans that traditionally follow Celtic Football Club and anything linked to their history and tradition. Celtic Football Club and their fans have been a huge supporter of the Thai Tims and continue to have a strong community partnership. Follow the Thai Tims on Facebook. The Thai Tims are full of energy – just check out their YouTube clips there are plenty of them. They also do a lot of travelling not just in Thailand but also overseas. They have recently visited Scotland to meet the Celtic football team and to also sing before a Scottish Premiership game. They also love swimming and always enjoy visiting the Regents International School Pattaya and staying overnight which includes a long session of night-swimming! It has always added an extra cultural and inspiring dimension when events such as International Day, Clean-up the World and Picnic in the Park have involved the Thai Tims as special guests. I would like to thank Karen Partyka for making the initial connection and believing that the two school groups could work and learn together. On Monday, June 24th, a group of Gap Staff accompanied Mr. Crouch, Khun Da, and Mr. Jones on a visit to the Triamsuksa School in Chantaburi province; home of The Good Child Foundation and the Thai Tims. Khun Da and Mr. Jones were on a mission to set up a possible Outdoor Education activity with the kids from the school, while Mr. Crouch wanted to touch base and strengthen bonds with an already closely knit community partner. For us Gap Staff, it was an opportunity to visit a community partner in rural Thailand and hear the incredibly inspiring story behind the Thai Tims. Triamsuksa School is one of the only in Thailand which allows children with down syndrome to integrate into a mainstream education system. Normally they are sent to an institution or essentially exiled from Thai education, and from parts of society. When Mr. Lennon’s first son, Berni, was born with down syndrome, he and his wife Pun worried for Berni’s education. They offered to teach English for free at Triamsuksa School if Berni was offered a place, under the condition that they were allowed to teach the kids football songs. As a result of these songs, the Thai Tims have a deep connection with Glasgow Celtic Football Club. Mr. Lennon is a Celtic fan, and he has written dozens, perhaps hundreds of songs about the club and its players that the kids sing together to help raise funds for The Good Child Foundation. They are a very famous group of kids, not just among Celtic fans in Scotland and Thailand, but around the world. Throughout the day we were able to look inside the newly constructed Reamonn Gormley Memorial Hall; the strikingly bold centerpiece of the school’s buildings. We also met Nuey and Nook, two of the younger children in the school with down syndrome and Mr. Crouch enjoyed a lovely tea party with them. We were told about the recent trip to Scotland where 47 kids from the school were taken to meet the Celtic players, and sing at one of the games. Mr. Lennon explained that the criterion for selection for this trip was based upon an act of bravery which seemed fitting, as bravery appeared to be a quality which resonated through every aspect of the school. It was incredible to see the passion emanating from Mr. Lennon as he talked about children with down syndrome and the Thai Tims, and it was clear that Pun’s same passion, as well as her reassurance and support of her husband was just as strong. After visiting a few classrooms and hearing the kids sing some of their Celtic songs, Mr. Crouch, Khun Da, and Mr. Jones did some final planning with regards to activities for next year between Regent’s and the Thai Tims. We left for Regent’s in the afternoon, feeling inspired, impressed and lucky to have gotten a glimpse of all the things the Lennon family has done for Triamsuksa School, and for down syndrome children in Thailand.